Lauren and her husband Seth are magic!!!! She is honest and always gets the best shots!!! Love them and would use them a million times over!!! The package I got came with engagement, bridals, and our wedding day of course! Love, love, LOVE Lauren and Seth! They are definitely the ones to choose! Lauren is very personable and treats you more like a friend than a client. The comfort allows every shot to come so natural to the client. I'm not one for photos of myself, but I love the photos taken by Lauren and Seth! Lauren was such a sweetheart to work with! She made me and my now husband comfortable during the sessions! She was so patient with me because, heaven knows, I am camera shy and don't know how to pose sometimes. 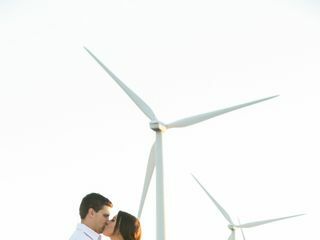 The outcome of all the photos both engagement and wedding were beautiful! She captured everything that we wanted amidst the little bloopers that happened during the wedding :) I will hire her again if given the opportunity! Lauren is amazing, and so is Seth! I cannot imagine using anyone else to capture our big day. It was absolutely perfect, and worth every single penny! I would have paid double! Thanks to this dynamic duo we have images that will last us a lifetime. We cannot say thank you enough to Lauren and Seth! I loved the pictures that were done for our wedding. Lauren is the absolute epitome of professional photographer! 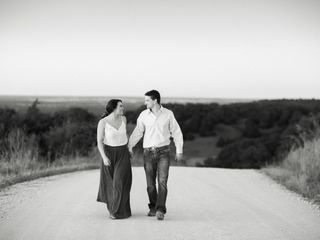 I have been photographed by Lauren and her husband Seth on 4 different occasions at this point and look forward to the fifth come this August when I stand in my sister in law's wedding. She is responsible for capturing beautiful moments for me and my husband during our engagement photos, bridal portraits, our wedding day, and also photos of my entire family this past September when we hired her to do family photos as a birthday gift for my mother. In all cases, Lauren expertly directed the shots she new were "winners", interacted with us in a friendly yet professional manner, and was excited to try new and interesting shots. It is always exciting to have special moments or times of life documented, be sure you are partnering with the best to get those instances captured, Lauren Pinson Photography is the absolute best! Lauren did such an amazing job, I don't even know where to begin! Everything she does, she does because she genuinely loves her job, and you can tell! She is so flexible and willing to work with you no matter what you ask from her. My husband claims she is part photographer/part wedding planner because if there was any situation we were unsure of how to handle Lauren was on top of it making sure everything was taken care of! She made us both feel comfortable in front of the camera. We could not have asked for more from a photographer and we recommend Lauren Pinson to everyone!! Wow! Lauren did an amazing job! From the first few messages online to actually meeting in person she was very attentive and truly listened to the things that I wanted. My photos turned out even better than I had hoped for and she was able to show the "feel" of the wedding. I love all of my photos and she captured every detail and a ton of special moments. Lauren and her team were fabulous and I feel blessed that I scored her as my wedding photographer! Lauren is an amazing, talented photographer and also a wonderful person. She is very sweet and worked with me during my hectic schedule. She not only captured special moments on my wedding, but also wonderful engagement/family photos, and amazing bridals. She even helped coordinate my wedding when my wedding planners failed to do their job. Lauren went over and beyond to make sure I had beautiful pictures to remember my special day and its wonderful moments. Thank you so much Lauren! Lauren was extremely flexible and pleasant. It was as if she was a part of the family and it was a pleasure sharing our wonderful evening with her! Lauren was amazing! Efficient and quick in communication, getting photos back to us, and putting our packages together. We loved working with her. She even went above and beyond by sending us free prints/magnets in the mail, traveling (without extra cost to me) to do my bridals in Fort Worth, and recommending other vendors to help with my wedding. I would recommend her to anyone! Lauren Pinson is unbelievable with her talents for photography! I can say I would not change anything about the pictures we received from her. She captured the most special day of our life and was very personal about each picture. Each picture had a special meaning behind it and we will always remeber that special day by her photos. If I were you, I would book Lauren as soon as possible, she's that good!!!! Every weddding day is stressful worrying about making sure things get done, one less worry was the photographer for me. She did an amazing job, was on time, very happy to take any pics we requested, and captured the perfect moments when they happened even though she didn't have a heads up they were coming. I have nothing negative to say about our experience with Lauren because she did everything right and so much more!!!! She went above and beyond for us! She is well organized and very talented, go check out her work on her website!!! 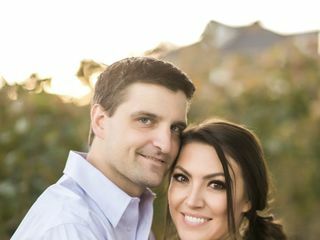 My husband Nathan and I discovered Lauren Pinson through a mutual friend—I wouldn’t have researched photographers in Wichita Falls otherwise. When she met with us in Sherman, our hometown at the time, we were immediately won over by her professional presentation, including a branded folder containing a contract and pricing information, (and by the gift card that paid for our coffee that morning). Although we prioritized photography over anything else for our wedding, we were still on a limited budget. But Lauren provided everything we wanted and more for what we could afford. Our package included engagement and bridal portraits in Denton, where we live now, and 9 hours of coverage on the wedding day including a first look and two additional shooters! In addition to all of her hard work behind the lens, she also provided us with the edited images, printing rights, and a wedding album. Lauren’s personality is delightful. She became our friend as well as our photographer. Nathan and I, camera-shy though we are, felt like we could be ourselves for her. Her style is beautiful in its simplicity. Our photos have enduring beauty because they’re stunning in their own right, minimally edited rather than overly altered to suit changing trends. The value of Lauren’s work is incredible with respect to the price we paid for unparalleled quality and professionalism. Throughout the wedding planning process I second-guessed and even regretted choices I made, but the decision to hire Lauren was the best possible thing that Nathan and I could have done to make our wedding day as memorable and beautiful as possible. 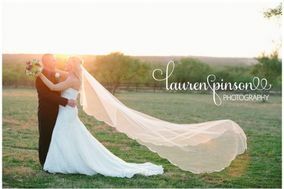 I can’t begin to explain how happy we are that we chose Lauren Pinson Photography. 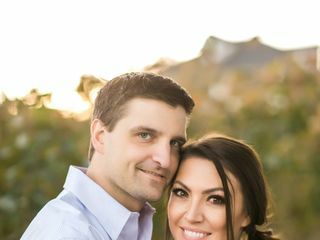 When choosing a photographer, I spent hours and hours researching and looking at engagement and wedding pictures of various photographers in the area on their websites and blogs. 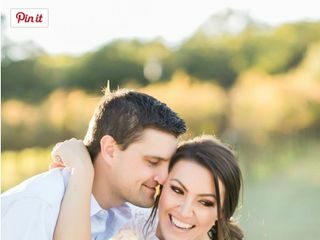 I had lived in Wichita Falls for less than 6 months when we started looking for a photographer, so we could only go by what we saw online rather than recommendations since I didn’t know many people in the area. Lauren’s work was far above the rest! We loved what we saw and were so happy that she was available for our date. Our engagement and wedding pictures turned out so much better than we could have ever imagined. Lauren was always very easy to contact and got back with us so quickly with any questions we had along the way. She gave us so many pointers on things to do on our wedding day and how to prepare. She is amazing! We are so excited to book her again in the future for other life events!